The current conversation around automation and artificial intelligence technologies creates a future vision where humans may not possibly compete against intelligent machines, and that everything that can be automated through deep learning, machine learning, and other AI technologies will be automated. 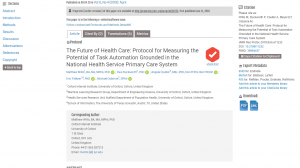 In this article, we focus on general practitioner documentation of the patients’ clinical encounter, and explore how these work practices lend themselves to automation by AI. While these work practices may appear perfect to automate, we reveal potential negative consequences to automating these tasks, and illustrate how AI may render important aspect of this work invisible and remove critical thinking. We conclude by highlighting the specific features of clinical documentation work that could leverage the benefits of human-AI symbiosis. Willis, M., & Jarrahi, M. H. (2019). 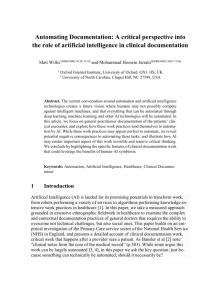 Automating Documentation: A critical perspective into the role of artificial intelligence in clinical documentation. In iConference. Washington, D.C.: Springer Lecture Notes in Computer Science.